I was deciding whether or not to use the word “protagonists” in the greeting or not because depending on the situation, either word would work in describing you, my wonderful warlock brethren. As protagonists, I want you to take the lead and be the central character to your own narrative and destiny. As antagonists, I want you to be competent and crafty contenders for all of your enemies. If you’re a new warlock and the idea of being hated doesn’t make you giddy, it soon will :) While other classes scream out their “Rawrs” at the start of the fight for self-motivation, warlocks cackle our delightful “Muhahahas” as an enemy or mob hits the ground after we take them down. See the difference? Now before we move on, let’s all take a deep breath and bask in the aroma the of the rich and addicting flavor of the Dark Arts to celebrate our success of relearning our class all over again. You did it! 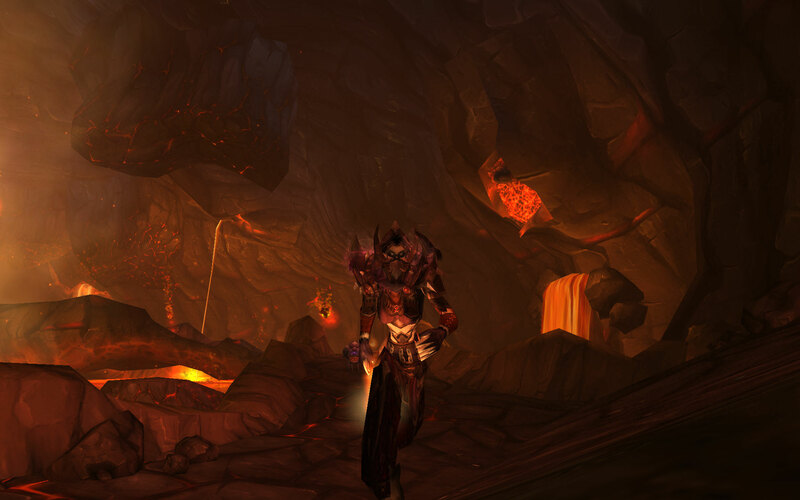 You’ve survived the “Great Warlock Revamp” which will go down in history as Patch 5.0.4. /em Amijade takes a big deep breath, holds it in then releases it with a calming exhale. Ahhhhhh! Isn’t that better? For some of the newer and younger warlocks out there who aren’t used to the sweet smell of yummy warlock success, it may at first appear to smell like burned or tormented enemies; however, over time you’ll enjoy it’s beautiful smexiness as if you were taking a bite of your favorite candy for the first time. So enjoy your moment to shine because as a reworked class you truly deserve it! Get ready for some amazing vistas! Now, it’s time to get back to business. With a little more than two weeks away, the new expansion looms at us like a Chaos Bolt on it’s direct path towards a mage our enemy. We can see it on the horizon moving towards us and either out of shock, disbelief or pure excitement many people are uncertain about what to expect or what to do next. 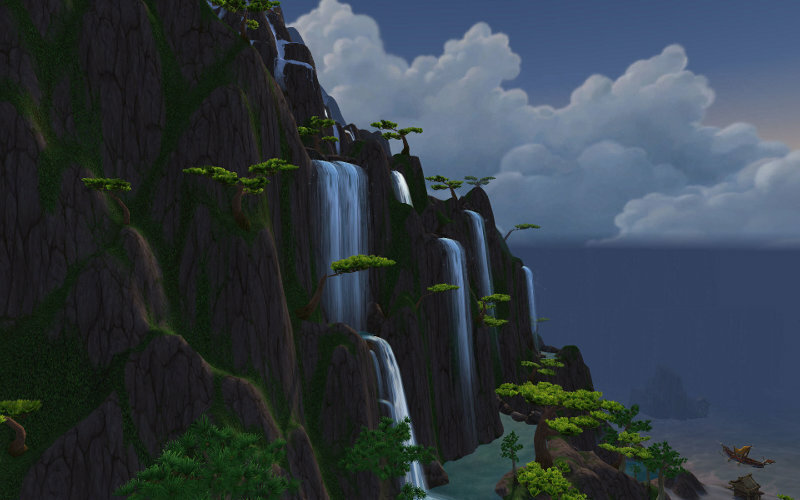 So whether you are planning on racing to the new cap level of 90 or if you plan on taking your time to stop and smell the roses or see all the waterfalls, let’s all take this small window of opportunity to discuss what to expect with the Mists of Pandaria expansion. Despite the fact that there was over a million beta keys given out for players and testers, there’ll still be a few problems. You may find a glitched mob or two. You may find a glitched quests or two. Some of your addons still might not be working or they may cause glitches with either the game itself or other addons. Nothing is ever perfect. Does anyone remember the submarine quest at the end of the Vash? 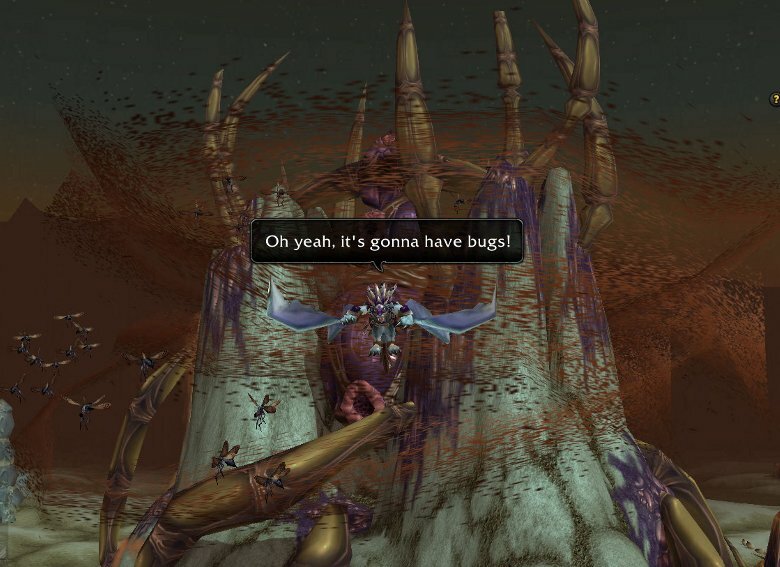 It was as buggy as a silithid hive in Silithus. There’s bound to be bugs so just expect them. Well, maybe not this buggy. Does anyone else get itchy when you visit Silithus? If you thought the flooding of information about the beta was already too much to handle, or if you thought the flood of information about the last patch was a lot…sit back, hang tight and hold-on! You’re about to see an information explosion that hasn’t been seen since Cataclysm launched. Don’t get overwhelmed by it all. Take in what you can handle at the speed you can handle it. Otherwise, you’ll drive yourself crazy. From the moment you move into the new expansion keep in mind that the mobs you face will be tuned higher in health and in strength. Since you won’t be able to fly until you reach cap, you’ll often have to fight your way into an area and fight your way out for completing quests. So don’t be surprised if you get swamped by mobs that add in the fight and you soon find yourself at a spirit healer. It’s going to happen, trust me. Getting knocked off your mount by roving pats? Yep, it’s going to happen. Some of the mobs will even chase you for quite some distance and continue to attack you. It’s going to happen. So always be prepared for a fight. No, I’m not running from any mobs…I’m running to go destroy some! Take the time to make room in your bags and bank space now. Besides the new AoE looting system, your bags and character bank are going to fill up quickly. From grey items, to cooking items, to Motes of Harmony, to greens level items and other unique stuff…many things will drop. Unless it’s grey vendor trash, I’d recommend hanging onto what you find for two reasons. First, you won’t know what you need until you need it. It’s better to let several stacks of an item sit in a bank spot than to go blow about 300 gold on them later on when you need them. Also, the AH markets will be crazy the first four or five weeks until the markets begin to level out. An item that went for 25 gold at the start could fetch much more as more people reach cap. It’s a good way to make better money as you decide what items will be important for you and what won’t. Does anyone remember the cost of Delicate Wings at the start of Cataclysm? I do! Derpy me sold them cheap because I was ignorant of their importance and when I needed them for the leveling I was kicking myself. As if there wasn’t enough gold sinks in the game! Blizzard is phasing some of the zones with this expansion by combining servers with low populations with ones that have a high population. I’ve already heard both good and bad things about this new system. Some people like the phasing of the zones because you can often find other people in the same area to group for questing. Some people don’t like the phasing of the zones because you can often find other people in the same area who are competing with you for quest items. It’s kind of a double edged sword depending on how you look at it. Another problem is that some of the phased areas are in different Time Zones IRL. So while the fishing tournie in Dalaran might have started, the areas around Northrend might not have spawned the tournie nodes because they are a couple hours behind. Will this new phasing system be perfected yet? Probably not. Will Blizzard address these new issues as they spring up around the system of phasing? Yes, I’m sure they will. Same area, different Time Zone! Bah! 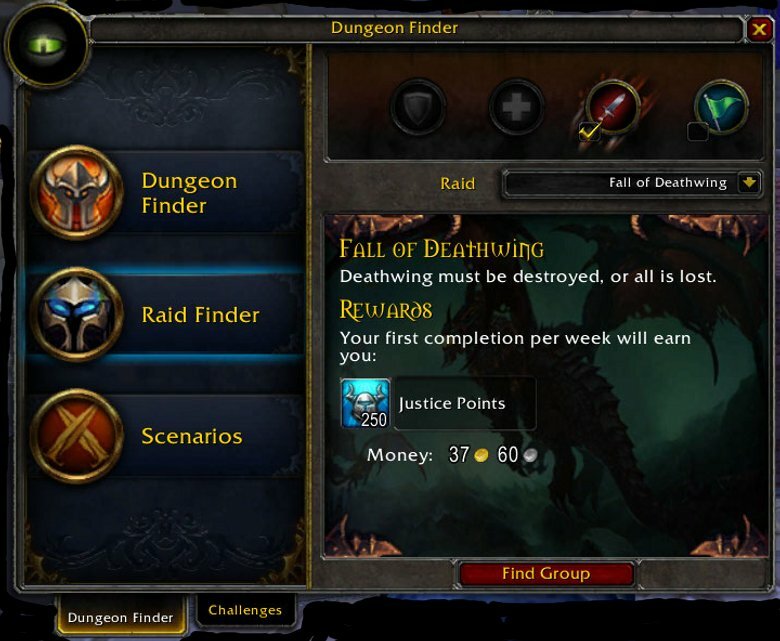 Dungeons, scenarios and raids…oh my! I personally didn’t raid or do any dungeons in my MoP Beta testing. The reason? I didn’t want to spoil all of the fun and the surprises of the new expansion for myself. I wanted to keep some things unknown to me and I also didn’t want to get burned out :) However, I have spoken with many people who have been testing the dungeons and I’m hearing roughly the same kind of feedback from them. While the new dungeons aren’t as painful as the 1 to 2 hour investment they’d been in Cataclysm, they aren’t going to be a free purple drop like a heroic EoT run either. Expect some wipes and expect that you might experience some drama in LFD and you should be fine. As always, keep calm and a level head when dealing with troll fodder. Other quick tips for the new dungeons? A little communication goes a long way. A little politeness goes a long way. A little understanding goes a long way. A little patience goes a long way. A little CC (crowd control) goes a long way. Don’t forget to smile and have fun, and never forget you’re a warlock and you represent our class so remain above the fray and you should be just fine. With every expansion, the learning curve gets pretty steep and remains that way for quite some time. Keep in mind everyone learns at their own pace and what might feel like common knowledge often isn’t. A good example is the new reagent the Dust of Disappearance. I’m sure by now you know what it is and where to buy it from the vendors, but I still see people on twitter bragging they have made a killing by selling it for 3x’s as much gold on the AH to ignorant players. I think there are enough ways on the AH to make money without having to take advantage of a person’s ignorance. Don’t you think we see enough of that IRL already? I don’t expect you to answer every questions for people in trade, nor do I expect you to share everything all the time with your guild. What I do expect from a good warlock is to aid and assist others when you can. As in RL, you’ll know when it’s a good time to offer your help. I can’t help but to share a quick story to prove my point from one of my experiences during the beta where asshat players drove me crazy. A couple of months ago, there was a bug in the beta where if you had your settings turned on anything higher than “good” most of the zones would appear like large pink cubes (no, I’m not talking about the ugly pink shards that float above my head in Affliction, but they were every bit as annoying). If you experienced this bug you couldn’t see anything but these big giant pink cubes all over your screen. A simple fix was to turn your setting down to “good” or below and the bug went away. There was a bug report about this on the forums as well, but most players don’t have the time to check the forums every hour of everyday. So you can imagine what the trade channel looked like as new players logged into the beta and freaked out by what they saw. The “Vigilance on Wings” (aka Joust quest) is still bugged. 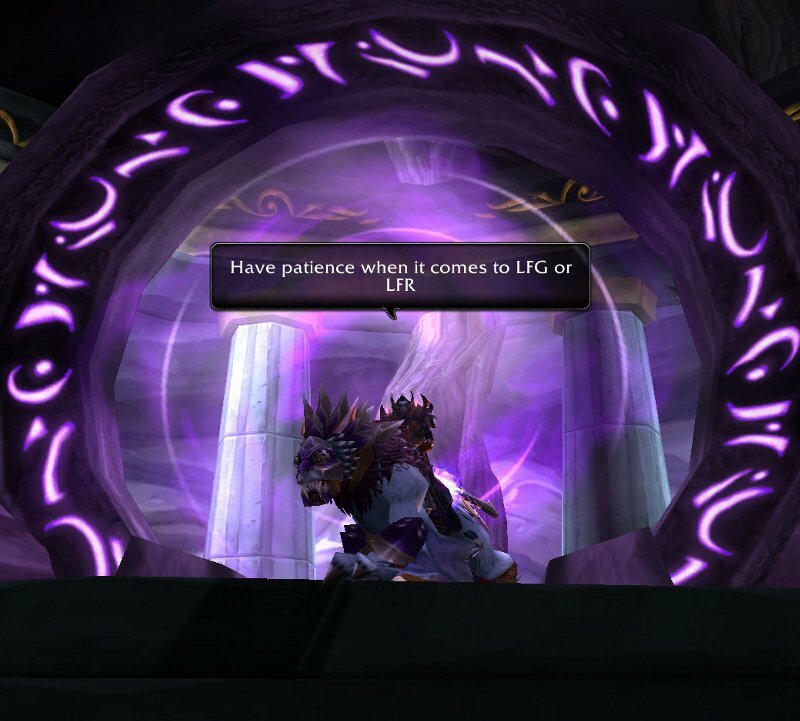 For some people you can enter, but you can’t leave the portal. Good time for a hearthstone! Well, it didn’t take long for the trade channel to settle down in it’s trolling of these players as they logged on and pretty soon the wise player didn’t need to spam his macro as much because the people that he helped soon responded to others in the same helpful way. It’s a simple story, but I hope it illustrates how reacting to a situation can either add fuel to the fire or keep things running smoothly. Many people never speak up or ask questions for fear of feeling dumb or in being ostracized for their ignorance. As a warlock, I’m all about offering up some nice FEAR as much as I can…just not in that kind scenario. So help others when you can in sharing the knowledge of playing the game because you’ll never know when you too will need something explained. A little patience goes a looooooong way! Racing to the finish line or taking your time? I’ve seen it happen in every expansion so far. Guilds either become stronger or they become weaker due to the new changes. This appears to me as a normal ebb and flow and I’m not sure if that fact will ever change. The main reasons for this can vary, but I think a major factor in these kinds of changes is the result of the leveling and progression component in the game. Don’t be surprised if you see a few guildies hitting the new level cap within the first week. At the same time, don’t be surprised if you see other guildies taking a few weeks or even a month or more to get to cap. When people reach the max level they’ll often want to move on to other content. It’s understandable so you can’t blame them. We had a great tank once who was the first player in our guild to reach cap. 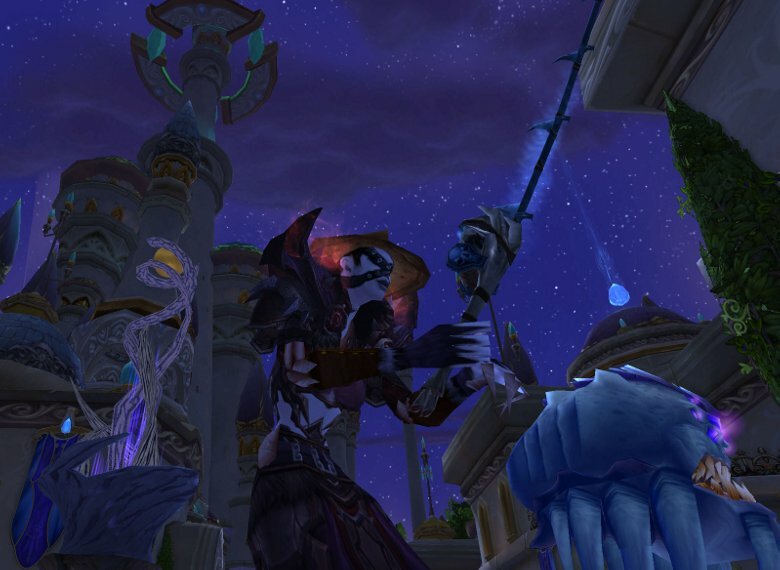 It was the launch of the Burning Crusade and he was about two or three weeks ahead of the rest of the guild. He was a good player and a great guy. As an older player (50 years +), he had a much greater amount of spare time than most to devote to the game. 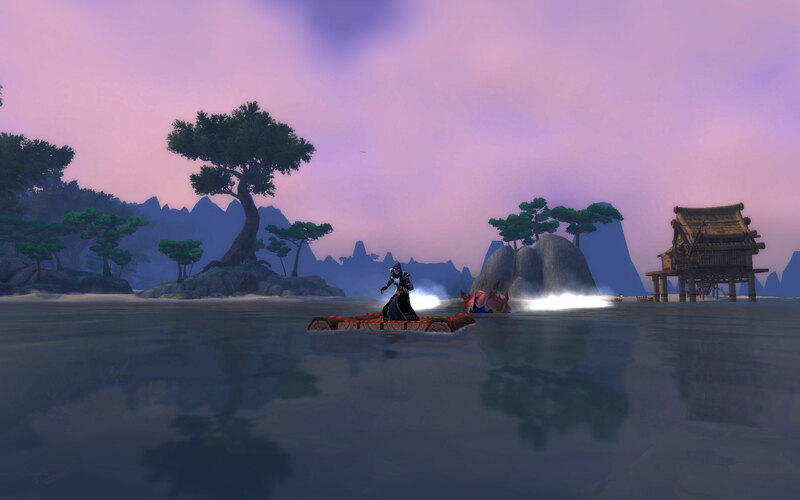 It wasn’t long before he realized he wanted to experiences things much faster than at the rate the guild was going. It was a sad day when he left to move to a guild that was farther in progression, but I think we all understood that our guild at that time didn’t meet his needs for what he was wanting to experience. During the Wrath of the Lich King expansion we had a large group of younger players leave our guild to go and start their own guild. It was painful when we lost those four good players. We could have begged them to stay and they might have done so, but would they’ve been happy? No, I don’t think so. They would’ve always dreamed of what running a guild was like or trying to make their way on their own. 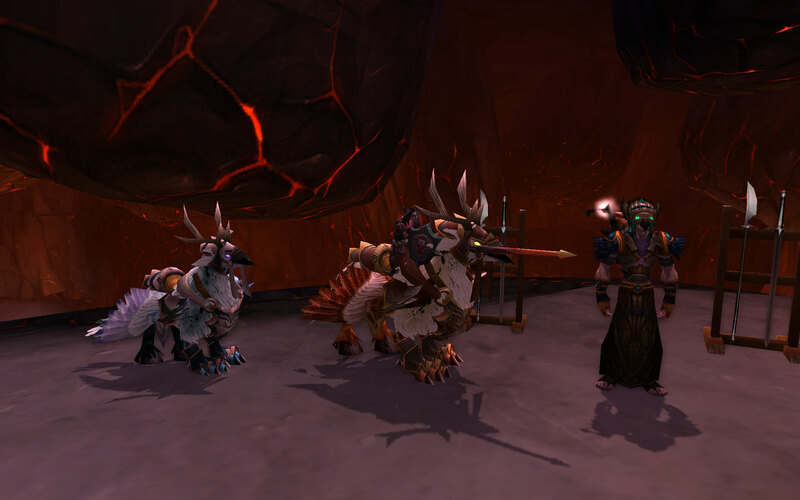 Believe it or not, near the end of the the WoTLK expansion, all four of these players came back to our guild having disbanded the one they created. After less than 1 year of branching out on their own they soon learned that a good guild takes work, dedication, and a sturdy set of rules and guidelines even if the guild was created with friends. My older tank friend still plays to this day on another server. His progression guild decided to switch realms where they could draw from a larger population server to help increase their numbers. The last time I spoke with him they were running 2 – 10 man teams two nights per weeks, and working on 25 man content 1 night per week. I’m happy for them all. 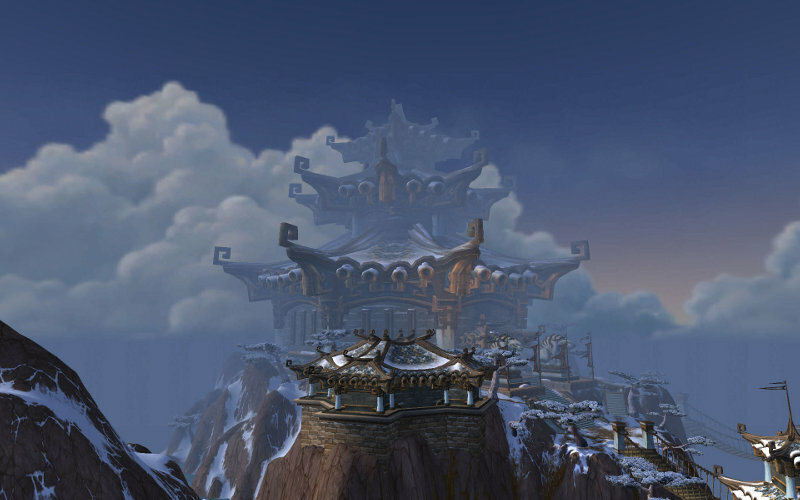 As it stands, I don’t see the Mists of Pandaria expansion being any different than what I’ve experienced and seen before in previous expansions. Both players and guilds progress at their own pace, so don’t be surprised if changes like this happens to you or your guild. If you decide to switch guilds or change servers…be honest to your guild and your current guild members. Yes, I know it’s not the easiest thing to do nor is it the easiest decision to make. Actually, it will be like ripping off a band-aid with a quick twinge of pain and then it’s over quickly. You’ll feel better for being honest and upfront, and usually this will stop any animosity that may occur later on. 10,000 Waterfalls? Really? No, I mean really, really? OMG! Let’s just hope the fishing is good! For me, my plan for the expansion is simple. I plan to take my time, have some fun and to stop and see some of the waterfalls along the way. 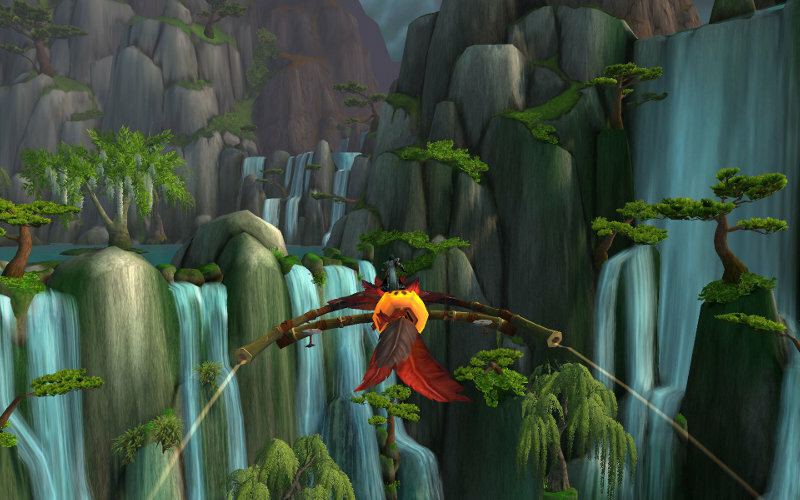 If you haven’t heard, there are 10,000 waterfalls in the new expansion. I don’t know about you, but that sounds like a lot of screenshots, a lot of fun, and a lot of work to some degree. Luckily for me, I know from experiences that I’ll get there when I get there and I’m sure you will to…whatever course or quests you decide to take. Enjoy the all the exploring and discovery! What a great post!! And your screenshots are absolutely stunning! You’re so kind! You know, my screenshots pale in comparison to the type of content you publish over at Imageheavy. I wish I had your good eye at framing. To make matters worse for me, now I have to contend with not being in or in first person, otherwise the pink floating shards above my head and in the middle of the screen will ruin a great shot. I hope they address this problem otherwise the crop tool might have to be my mainstay. Ugh! I hope not! Yes, it won’t be long. It’s bad enough I’ve got about 12 gig worth of screenshots now…time to invest in a portable storage drive maybe?